Thomas Mulcair, Brian Topp and Paul Dewar have highest name recognition among NDP leadership candidates. NDP supporters want a leader who stands for clear social democratic principles and who can stand up to Stephen Harper. With about two months left in the federal NDP’s leadership race, a new national survey from Ottawa-based Abacus Data finds that few Canadians could name more than one of the candidates running for the NDP leadership and 40% were unaware of any of the names presented to them. Among NDP supporters, 35% said they were unaware of any of the candidates and 54% said they were aware of less than two candidates. 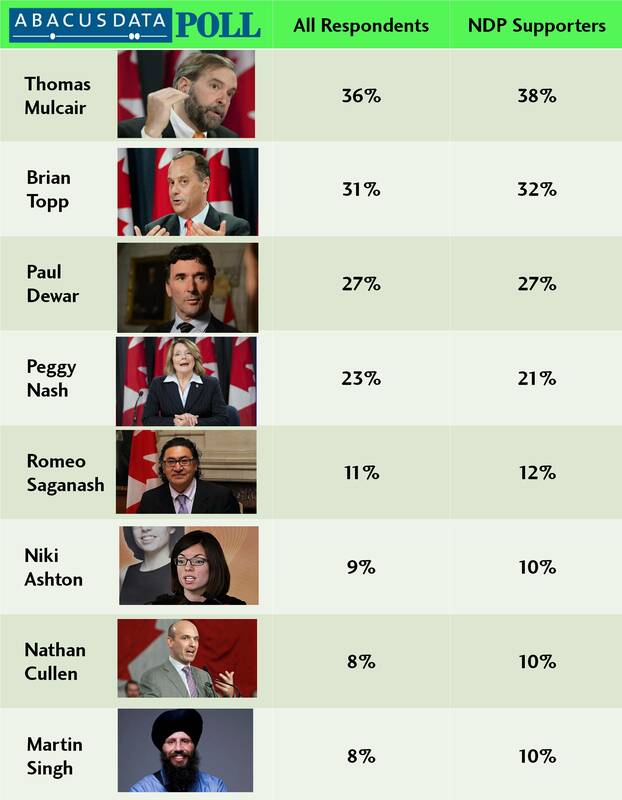 Nationally, Thomas Mulcair and Brian Topp were the most likely to be known by respondents. Thirty-six percent of respondents were aware of Thomas Mulcair while 31% were aware of Brian Topp. Paul Dewar (27% aware) and Peggy Nash (23%) rounded out the top four. Among NDP supporters (those who said they would vote NDP if an election were held the time of the poll), the order was the same with Mr. Mulcair (38%), Mr. Topp (32%), Mr. Dewar (27%), and Ms. Nash (21%) in the top four. Over three in ten NDP supporters had not heard of any of the candidates prior to our poll. Regionally, Mr. Mulcair’s name recognition in Quebec exceeded all other competitors in all other regions of the country and his national lead in name recognition was almost entirely due to Quebecers’ awareness of him. Sixty-four percent of Quebec respondents were aware of Thomas Mulcair. Outside of Quebec, Mr. Mulcair’s name recognition never exceeded 25%. Brian Topp was most known in Western Canada (35%) while Paul Dewar and Peggy Nash had higher name recognition in Ontario, at 36% and 33% respectively. When respondents who were aware of at least two candidates were asked which candidate would make them most likely to vote NDP, Thomas Mulcair topped the list with Canadians overall and among NDP supporters (21% overall, 36% with NDP supporters). Brian Topp, Paul Dewar and Peggy Nash rounded out the top four all close together among Canadians overall and among NDP supporters. Caution should obviously be used when interpreting these numbers. Even the results among NDP supporters mean little in terms of who may actual win the leadership since the results are not representative of actual NDP members. We must keep in mind that much of the federal NDP’s support in our poll comes from Quebec, and Thomas Mulcair is well known in the province and therefore most likely to be considered the best choice. The results demonstrate Mr. Mulcair’s challenge in this race. He is well known in Quebec and there is a certain level of goodwill among those who know him. But when the NDP leadership race started, there were very few NDP members in Quebec relative to other provinces. These numbers confirm his strategy: (1) sign up new members in Quebec and (2) convince members outside Quebec that he is best able to keep NDP gains in the province. Respondents were also shown a list of attributes that could be used to describe a party leader. They were asked to rank the top five attributes they believe are important in the next leader of the NDP. No single attribute was the clear preference for all respondents but 10% of respondents ranked “stands for clear social democratic principles”, “is tough and can stand up to Stephen Harper”, “able to fluently speak both official languages”, “is down to earth” and “has experience in business”. For NDP supporters, “stands for clear social democratic principles”, “is tough and can stand up to Stephen Harper”, “able to fluently speak both official languages” and “can beat Stephen Harper” were the top four ranked attributes. Interestingly, “can appeal to voters in Quebec” was ranked 1st by only 4% of NDP supporters, and was ranked in the top 5 by only 31%. From January 16 to 19, 2012, Abacus Data Inc. conducted an online survey among 1,000 randomly selected Canadian adults from an online panel of over 150,000 Canadians. Since the online survey was not a random, probability-based sample, a margin of error could not be calculated. The margin of error for a survey of 1,000 respondents using a probability sample is +/- 3.1%, 19 times out of 20.